Below you can see extensively the books we are going to use during our courses, a suggestion where you can buy them and their indicated prices. This first book in a series of four corresponds to the first level of language skills. Each teaching module focuses on specific grammatical phenomena and specific thematic vocabulary, which are gradually taught. The book is suitable for preparation classes for the exams of attainment, but can also be used for self-study. Emphasis is placed on the parallel development of skills of understanding and production of oral and written speech. It is richly illustrated and is user-friendly. The book is accompanied by CDs. 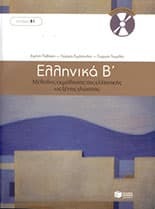 The second book of the series, Greek B, corresponds to B1 level of the KEG. Like Greek A, which quickly emerged as one of the most popular Greek instruction manuals in Greece and abroad, this book contains rich illustrations, written and oral exercises of all kinds (phonological, grammatical, editorial, text comprehension, etc.) as well as cd-audio with dialogues and acoustic exercises. 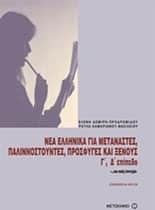 The sections of this book have been tested for several years in adult preparation classes and introduce students to the reality of modern Greek language and society. Communicate in Greek is one of the oldest methods for the learning of Greek as a foreign or second language, which takes the student from a beginner to a post-intermediate level. Books 1 consists of 24 lessons, four of which are review lessons. Structure and language functions are introduced through dialogues and texts; oral practice through everyday situations. It also contains grammar tables, structure and vocabulary exercises; listening comprehension exercises; vocabularies in English and keys to written exercises. Textbook plus CD included. Followed by 2 exercise books. Answers to the exercises.It covers units 1- 12 of the book Communicate in Greek 1. Answers to the exercises.It covers units 12- 24 of the book Communicate in Greek 1. Book 2 consists of 24 units, four of which are review units. Structure and language functions are introduced through dialogues and texts; oral practice through everyday situations. It also contains grammar tables, structure and vocabulary exercises; listening comprehension exercises; vocabularies in English and keys to written exercises. Answers to the exercises.It covers units 1- 12 of the book Communicate in Greek 2. Answers to the exercises.It covers units 12- 24 of the book Communicate in Greek 2. 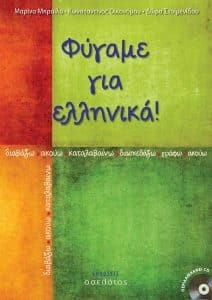 The book addresses repatriated Greeks, the younger generations of expatriate Greeks and foreigners who wish to learn Greek and to obtain the Certificate of Attainment in Greek for Level C.
Φύγαμε για ελληνικά! 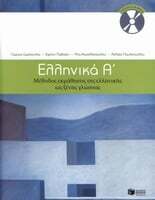 is intended for adult learners of Modern Greek who are at an intermediate level. This book can be used either in the classroom or for self-study. It covers a wide range of everyday life topics and it also provides information on various social and cultural aspects of life in Greece. The first part includes a text or a dialogue written in simple, contemporary language followed by a reading comprehension and a vocabulary exercise. The second part aims to help you to practise and improve your aural comprehension skills.